November brings longer nights that start earlier; a gloomy prospect for some but not for an astronomer whose glass is always half full (I really should find a pub that serves a full measure!). This time of year can bring crystal clear skies and even the full Moon, on the 28th, can be stunningly beautiful and bright. 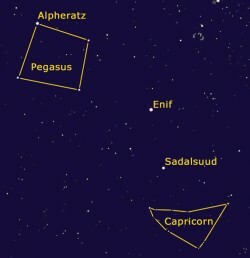 Away from the full Moon, the constellation of Pegasus dominates the south-eastern sky. It’s easy to find, especially if you were paying attention last month and know how to find the “W” that is Cassiopeia. Pegasus is a big square of stars below and to the right. Once you have located it, it’s very obvious. Look to see how many stars you can count inside the square. In our fairly light-polluted skies, you may get up to ten or so but in better conditions, it’s full of stars. The top left star of the square is called Alpheratz and is very interesting for a couple of reasons. It is a double star but this is only known from analysing the light from it, the two being so close together they cannot be separated by a telescope. This analysis also shows Alpheratz to be rich in mercury, not to be confused with Mercury, which is hiding behind the Sun for most of this month. So if you want to see a giant glob of mercury hanging in the sky, go outside and have a look at Alpheratz. No, wait, come back and read the rest of these notes first! If you draw a line through the bottom two stars of Pegasus and continue to the next brightest star, you have reached Enif, in the head of the flying horse. This star is odd in that it is known to expand and contract in a rather erratic fashion. Who knows, perhaps one day it will explode! Below Enif and right a little, in Aquarius, is Sadalsuud, which means, in Arabic, “the luckiest star of all”. Quite why this star is so lucky, I haven’t a clue; perhaps it’s because it has survived despite being so close to the unstable Enif above it. Both these stars are making an escape bid from the Milky Way, travelling away from the plane of our galaxy, rather than rotating round with the rest of us. Lower still and a little more to the right is the constellation of Capricorn, the top line of which is easy to see but the rest of the triangle not so. Now I don’t know if you are aware of this, but Capricorn is a mythological creature with the head of a goat and the tail of a fish. How does that work? How on earth does it get about? What were the ancient Greeks on? A little later in the evening, from 9pm or thereabouts, Jupiter will be high enough to see in the east, in the centre of a line with the stars Aldebaran in Taurus and Alnath in Auriga. It will be interesting to watch Jupiter as it passes above Aldebaran and then turns back again during the next six months or so. The full Moon on the 28th is very close by. The middle of the month is a good time to look out for meteors as we have the Taurid shower around the 12th and the Leonids around the 16th. OK, now you can go out and look for Pegasus!